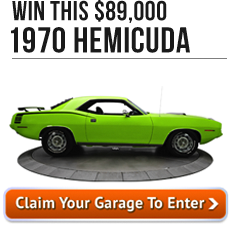 ← 1970 Plymouth Hemicuda Giveaway! “When assembling the MCG Expert Panel, we looked for active professionals with proven, detailed experience regarding the history, technical nature and overall culture of the cars they cover,” said Product VP Tanner Fritz. Expert Panelists include:Richard Ehrenberg: Chrysler, Dodge, Jeep & Plymouth; Rick McLaughlin: Pontiac Trans Am; Kevin Mackay: Corvette; Jerry MacNeish: Camaro, Chevelle & Nova; Bob Perkins: Mustang; and Joseph Carroll: Classic car marketplace, values and trends. 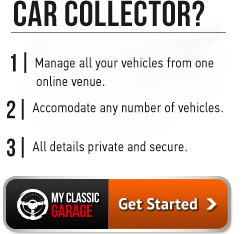 Members can access the Expert Panel at MyClassicGarage.com for free day or night. The informative answers become an archived resource for all members. Based in North Carolina and founded by collectors, MyClassicGarage.com is the ultimate online resource for classic car collectors and enthusiasts. The cloud-based application allows users to track every facet of their collection and participation in the hobby – past and present. Classic car owners share content, video and photography with the world, at the click of a mouse. Users buy and sell cars in the MCG Marketplace- a free marketplace. The Knowledge Base and additional research tools enable enthusiasts looking to get into the classic car hobby to get up to speed quickly, empowering them to make wise purchase and sale decisions. The MCG Social Garage will create the world’s first integrated social network solely dedicated to the classic car hobbyist. The ClassicDNA will lay the groundwork for creating provenance on every classic car within the MCG network. This entry was posted in Product Updates, Uncategorized and tagged classic car, classic car experts, classic car questions, classic cars for sale, expert, expert advice, muscle car, muscle car questions, muscle cars, muscle cars for sale. Bookmark the permalink.